Currently, consumers prefer fizzy and flavored drinks, which is expected to escalate the growth of the orange extract market. Due to the adverse health effects of artificial flavors, individuals have opted to switch to drinks that contain natural fruit flavors. Health conscious individuals are showing more interest in plant-based drinks over other carbonated beverages. Also, consumers show a reduced preference for milk-based drinks, owing to various reasons such as lesser shelf life, presence of lactose, adulteration, etc. This is also a major factor expected to drive the growth of the global orange extract market. This TMR report on the global orange extract market analyzes opportunities in the market, and presents updates and insights relating to various segments of the global orange extract market over the forecast period 2018–2028. The report also provides historical data of 2013, along with the estimated data for 2018, and forecast data up to 2028 in terms of value (US$ Mn) and volume (MT). In terms of value, the orange extract market is expected to expand at a CAGR of 5.1% over the forecast period. The current study reveals the orange extract market trends and market dynamics in five major regions - North America, Latin America, Europe, Japan, Asia Pacific except Japan, and the Middle East and Africa. The report also comprises the study of current issues with consumers and opportunities for the orange extract market. The report explores the global orange extract market for the period 2018–2028. The overriding goal of this report is to provide insights into the developments in the global orange extract market that are progressively helping to transform worldwide businesses that are associated with the same. It is essential to consider that, in the wavering economy, we provide the estimated (Y-o-Y) year-on-year growth rate along with the Compound Annual Growth Rate (CAGR) for the overall forecast, to understand the better analysis and evaluation of the global orange extract market, and to discover the equitable opportunities. Yet another key feature of this report is the analysis of the global orange extract market and the corresponding revenue forecast is also carried out in terms of absolute dollar opportunity. This is generally neglected while forecasting the overall market. Absolute dollar opportunity analysis is highly essential in determining the degree of opportunity that a provider can observe to execute, as well as to distinguish the potential resources from a sales perspective in the global orange extract market. The global orange extract market report starts with an executive summary, and the definition of various segmentations involved and their respective shares in the global orange extract market. The report also includes the major macroeconomic factors with an outlook of orange extract in the global extract market. The report further highlights the market dynamics which covers the drivers, restraints, opportunities, and trends in the global orange extract market. The report also highlights the study of current issues with processing, and opportunities for orange extract market. It also includes value chain analysis that provides a detailed structural view of profitability from the manufacturer to the end user. In order to provide users with a comprehensive view of the global orange extract market, we have extended the competitive analysis of key market players and their strategic key developments. The competitive dashboard provides a detailed comparison of orange extract manufacturers on valuable parameters such as total revenue, key product offerings, key strategies, and key developments. The study emphasizes the global orange extract market attractiveness analysis by form, nature, end user, distribution channel, and region. To estimate the overall market size of orange extract, the report considers various preliminary aspects based on secondary research. Furthermore, it highlights quantitative analysis such as region-wise market shares, and market shares by form, nature, end user, distribution channel, and other qualitative inputs from primary respondents, which have been incorporated to arrive at accurate market estimations. The forecast presented in the orange extract market report arrives at the total revenue being generated, and expected revenue contribution in the future by the global orange extract market. Detailed profiles of global orange extract manufacturing companies are also included in the report to evaluate their long- and short-term strategies, key product offerings, and recent developments, as they have a significant effect in the global orange extract market. 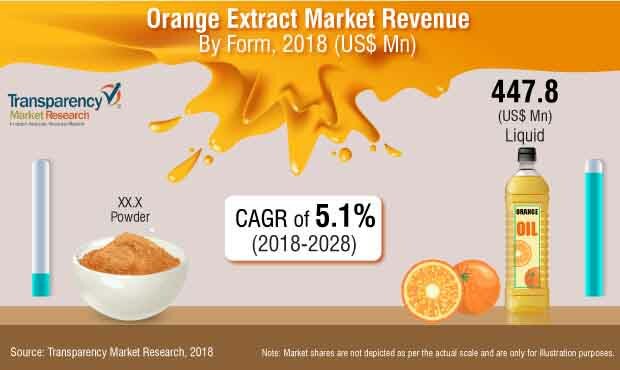 Major market competitors covered in the orange extract market report are Döhler GmbH, McCormick & Company, Inc., Southern Flavoring Company, Inc., Cook Flavoring Company, LorAnn Oils, Nature's Sunshine Products, Inc., Nielsen-Massey Vanillas, Inc., etc.